The town is located 18 kilometers from Segovia, it enjoys a privileged location to visit the most outstanding places of the province such as La Granja, Turégano, Pedraza, Sepúlveda, Hoces del Duratón, Cuéllar or Coca, all of them accessible in a maximum of 45 minutes. .
And if what you like is to leave the car parked, the area has a large number of roads and paths to walk through with peace of mind, as well as exploring the beautiful valleys of the Polendos stream and the Pirón and Viejo rivers, touring the mountains of oaks and junipers or simply stroll peacefully through the meadow and fresneda that extends next to the town. It is a small house in stone and wood. 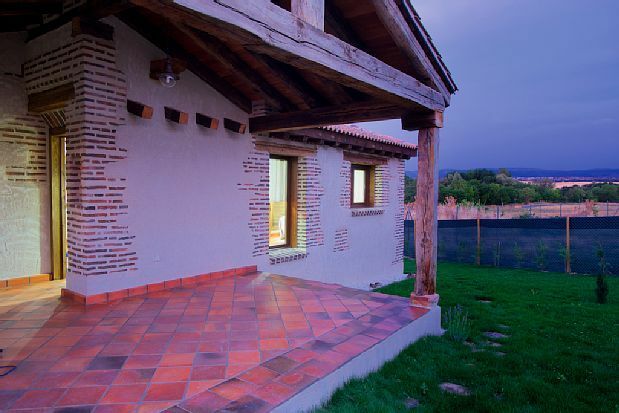 Located on the outskirts of a small village, without any neighbors sticking is the ideal place to enjoy a ROMANTIC DAYS as a couple or simply RELAX and DISCONNECT from daily stress, enjoying warm winters in the warmth of the fireplace or fresh summers inside of charm protected by thick walls. You will hear the singing of the birds, or simply the sound of silence and you will enjoy the PEACE AND TRANQUILITY that surrounds you. Take the first step outside and step on the meadow, enjoy a dinner in the light of the stars or a breakfast with the sun's rays. You will enjoy quiet walks through the small streets of the village, for its centennial fresneda, by the margin of the stream that crosses the meadow and you can venture on some route to the Valley of the Pirón through the mountain of Holm oaks and junipers until you reach the Roman Bridge of Caovatillas where we enter the karst area of ​​beautiful valleys with striking rock walls where the mixture of plant species is something worth enjoying. The village, although small, has a restaurant, a concert hall, craft workshops, a shop selling typical products, all of which give it a distinctive touch. At 5 km you can enjoy public swimming pool, at 18 km we have Segovia, at 22 km La Granja de San Ildefonso, at 17 Km Turégano with a beautiful porticoed square, its castle and where to enjoy one of the best roasts in the province, and between 30 and 40 km around places of cultural, architectural and landscape richness such as Las Hoces del Duratón, Sepúlveda, Pedraza, Cuéllar, Coca or Santa María La Real de Nieva. In short, it is an ideal place to RELAX AND DISCONNECT, to ENJOY NATURE, or to KNOW THE PROVINCE since in an environment of 40 km we have the places with more relevance and charm to visit.